The Mayor of London has said Brexit could be halted if the Labour Party made staying in the European Union a manifesto policy, and won the next election. Sadiq Khan said it could still be possible to ‘trump the referendum’ result by effectively putting it back to the public as a manifesto pledge. The Mayor has made the intervention at a time his party is in turmoil over its own position, though he has never waivered in his pro-EU stance. He told the Guardian: ‘For it to have credibility with the British public, there would have to be a Labour manifesto offer, because the public would say, not unreasonably “Hold on a sec, we voted to leave and you’re now sticking two fingers up at us”. 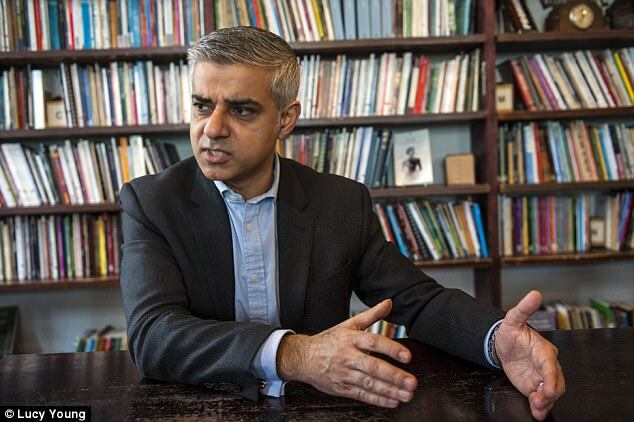 Sadiq Khan, the Mayor of London, says Britain could stay in the EU if the Labour party offered it as a manifesto policy. The Labour party has been split on Brexit since the referendum last summer, with the leadership, including Jeremy Corbyn saying the result should be respected but other high-level MPs calling for another referendum. Earlier this week, the opposition party was thrown into disarray as the Shadow Chancellor John McDonnell contradicted Mr Corbyn over the single market claiming Labour only wanted the ‘benefits’ of the single market and hinting they could back continued membership. If the Muslim mayor of London is successful in stopping Brexit then one of the leading countries of Western Civilization, freedom, and civil liberties will cease to exist.